Beat this. 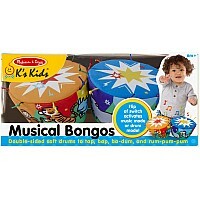 With the flip of a switch, you activate 3 play modes: a drumbeat, a song kids can drum to or "unplugged" quiet play. Soft, colorful cloth design delights the senses of sight, sound and touch – with fringe added for texture! For ages 6-36 mos, from Melissa & Doug.